You find this Stp Ruine by following the D 940 towards Neufchâtel from the south. The road goes for a part next to the railwaytrack and you take the first crossing. A sharp turn left and then the first road right, all the way up the hill. Just after the battery, park and enter the fence to the little forest west. There are foxes in that area; be aware of the clamps. (pièges) The former commandpost of the infantery regiment 148(IR 148) was housed in the bunkertype 609, which has two floors. Besides 2 x 622 for personnel, one converted into a 622 hospital, a bunker type 119, was built as the firecontrolpost for the battery nearby. This battery had 4 x 669 with 10 cm guns and was manned by 6./AR 149. The headquarter for its regiment, AR 149, was placed in a second 119, which is more to the east and also visited. The bunkers in the western part are interconnected with an underground corridor of which parts were still accessible in 2000. Henk Adriaanse and his team explored this and more tunnelsystems here in 2011. More to the west there are hudge storagebunkers. 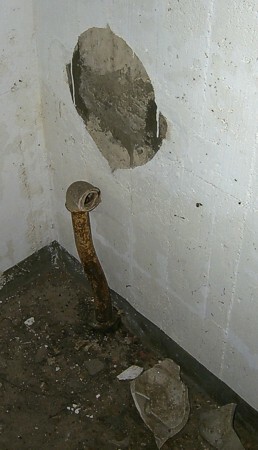 The remains of an urinal in the 609.